November 2015 - The President of Angola, the Vice-President and a state delegation consisting of 12 government ministers paid a visit earlier this week to the Quiminha Project being carried out by TAHAL Group. The President, who was greatly impressed with the project, summed up his visit in warmhearted and admiring words: "I am extremely pleased with the implementation of the project; the Quiminha Project serves as a model for Angola and for Africa as a whole." It was last Friday that the telephone rang at the office of Yakov Orenstein, Managing Director of TAHAL Angola and Project Manager of the Quiminha Project. 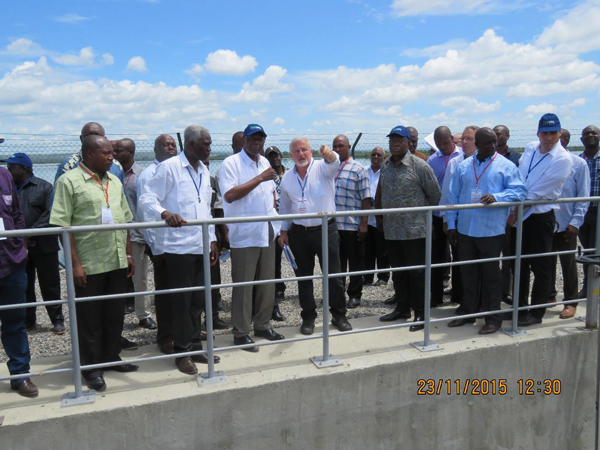 At the other end of the line was the Governor of Luanda, informing him that on the morning of the following Monday an official delegation headed by the President was to visit the project. "Just as I put the receiver down it started to rain heavily, a regular downpour," says Yakov. "It was the first time we were experiencing proper rainfall since the start of the present rainy season, and this meant that we would have to perform repairs and prepare the groundwork for the visit with very little time to spare." Participating in the visit were the President, José Eduardo dos Santos, the Vice-President, the Head of the Civil Cabinet (who is the most senior minister in the Angola Administration), the Minister of Agriculture, the Minister of Water and Energy, and 10 other ministers. It was the largest and most senior delegation to visit the project and was accompanied by heavy security in the form of military personnel. 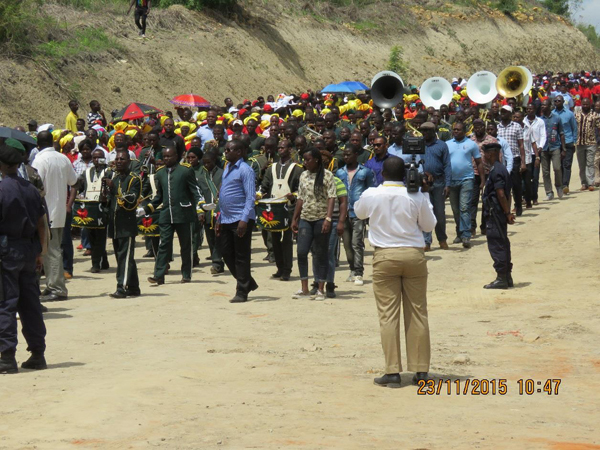 Thousands of local residents also turned out to welcome their President and his government officials. On being informed of the visit, Saar Bracha, TAHAL's President & CEO, and Gil Etzion, EVP & Director of TAHAL's EPCM Division, quickly got on a plane to Angola. They arrived at Luanda airport a mere two hours before the President was due to reach the project site. A police jeep and eight soldiers were waiting to rush them down the crowded city streets, sirens wailing and horns blasting, to make sure they would be in time for the official welcome. Meanwhile, much commotion and excitement were evident at the site of the project, which occupies an area of about 50,000 dunams. 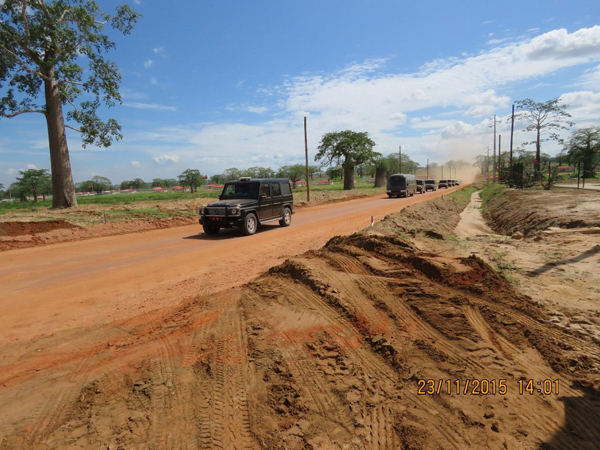 Throughout the previous Sunday, the official day of rest in Angola, contractor personnel had worked feverishly to prepare the access road to the intake. The visitors' tent, PA system and electrical wiring had been put in place two hours before the President arrived. Senior ministers from the Ministry of Agriculture, the entity responsible for the project on behalf of the state, could be seen roaming the premises all of the previous night, checking to see that everything was ready for the presidential visit. A stream of buses began to make its way towards the intake, the site that opened the visit. Thousands of local men and women took up positions along the roadside in order to wave to their President. A long convoy of vehicles arrived, preceded by the local military band marching along a short route, to the accompaniment of loud drum and trumpet fanfare. The President and Vice-President had barely managed to step down from their vehicles when Yakov rushed up to them and crowned them with hats adorned with the inscription "TAHAL Angola." These hats would feature later in the day on the front pages of the local newspapers and in the newscasts that were airing the event. The visit covered every key installation in the project: the intake; the large water storage reservoir; the greenhouses and poultry houses; Zone 5, where extensive mine clearing had been carried out; the logistics centre; and the public buildings, where an improvised press conference was held as a culmination of the event. In his brief speech the President said: "I am extremely pleased with the implementation of the Quiminha Agricultural Development Project. Working the land is the right way forward and the products that the project will generate are truly impressive. This project serves as a model for Angola and for Africa as a whole. We must continue to invest efforts in fighting hunger and poverty in Angola – something that the Quiminha Project is indeed accomplishing." 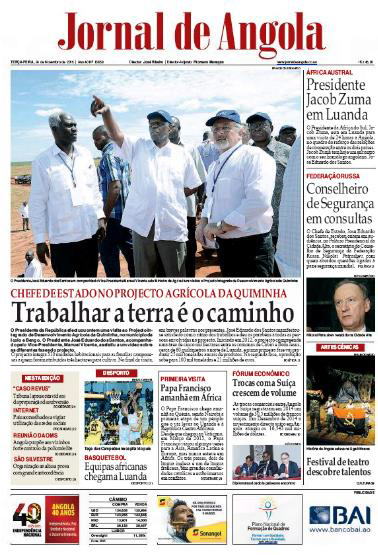 The President's visit received widespread media coverage: the main television stations sent teams to broadcast the visit live throughout the day; Jornal de Angola, the most popular newspaper in the country, devoted front page headlines to the visit and featured a full-page article on the project; and some 100 media personnel and reporters participated in the visit and in the tour of the various installations. The Quiminha Project is a genuine source of pride for TAHAL. It is an operation in which hundreds of millions of shekels have been invested and which has involved the mobilization of dozens of Israeli firms and agencies (specializing in agricultural technologies, irrigation systems, greenhouses, poultry houses, and others). The project demonstrates the entire spectrum of TAHAL's capabilities in developing countries in Africa and elsewhere in identifying solutions to ensure food security, from locating sources of water, through design and construction, to processing and marketing of the agricultural products. 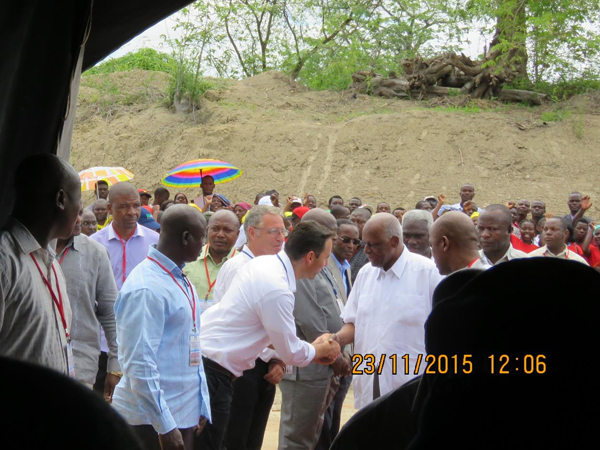 The visit by the President of Angola, government ministers and their extensive entourage was an unqualified success. The huge investment of effort, both ahead of the visit and throughout the course of the project, has borne fruit, for which special kudos is due to the project personnel and management.